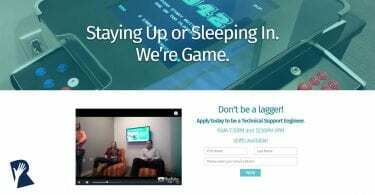 We hope you enjoyed our RallyFwd™ Let’s Humanize the Candidate Experience virtual conference! We’re thrilled and humbled to have had more than 3,500 people register – and for 99.5% of survey respondents say they’d attend again in the future! Thx again to our RallyFwd sponsors: Glassdoor, The Muse and TextRecruit – their support helped make the conference happen. 1 – Review your current Recruitment Marketing plan for 2018 to see where you can improve candidate communications to be more accessible and responsive as an employer brand. In her introduction to RallyFwd, Rally Founder Lori Sylvia says candidates now have 4 expectations for employer brands: to be transparent, authentic, accessible and responsive. Authenticity and transparency have been table stakes for some time, but now we must be accessible and responsive too. Candidates want 24/7 availability, like what they’ve come to expect from the best customer-first brands. In short, what candidates expect is better communications. The latest Talent Board research shows that when candidates report a bad candidate experience, it’s because of a lack of communication from the company. The Talent Board found that 52 percent of candidates were still waiting for a response 2-3 months after applying for a job, up 10 percent from the previous year. Today, if you have a candidate experience problem, you not only affect your ability to recruit, you are now affecting your company’s ability to grow. 46% of job seekers who have a negative candidate experience say they’ll take their business elsewhere, according to the Talent Board. Bottom line: the candidate experience problem is a communications problem, and you CAN make an impact to improve it! 2 – There are two new technologies worth evaluating to improve accessibility and responsiveness in your candidate communications: chatbots and text recruiting. Has your team ever received a 94% response rate on InMails or emails? Likely not! In the RallyFwd presentation Make Candidates : -) Using Text Messaging to Respond (and Hire) Faster, John Turner from Trilogy Health outlines how their Talent Acquisition team received a 94% response to their text recruiting campaigns using TextRecruit. For Trilogy Health, text opened up a new communication channel that was convenient and accessible for healthcare candidates across different levels (from entry-level to executive). Text messaging fit in with healthcare candidates’ busy lifestyles, allowing them to respond whenever and wherever. (Psst.. looking for more info here? You can dive deeper on how text recruiting works, along with best practices, by checking out our Rally™ How To Guide: 4 Ways to Text the Modern Candidate). Another up-and-coming HR tech with lots of promise was overviewed by Adam Glassman from Cox Enterprises in his presentation, How Chatbots Can Make Your Company More Human. Adam explains how chatbots can ironically provide a more “human” touch by allowing job seekers to have their questions answered immediately. Adam describes how concierge chatbots can enhance your career site by providing a more engaging approach to the outdated FAQ page. The chatbot is a more interactive way to answer questions that candidates are asking – which also provides a great employer brand impression. 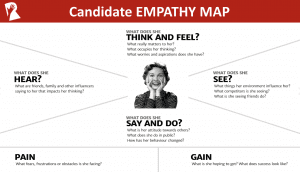 3 – Take a critical look at the first touchpoint in your candidate journey to ensure that it’s designed with the human (candidate) as first priority. Our opening Keynote Speaker, Jeanne Bliss, explains how by applying the principles of her #MakeMomProud approach, you can execute on your marketing, brand and candidate experience strategy more thoughtfully to create a more appealing process that will put more candidates in your pipeline in the long-term. Jeanne encourages us to be aware of how we say “hello.” Is our “hello” as welcoming as our mom’s would be? Is our initial touchpoint designed with process first in mind, or is it designed with the candidate as the first priority? The quality of our first touchpoint with candidates is ultra important, as this will influence whether they’re drawn in further to apply or not. An example of a great first touchpoint would be a personalized landing page with content geared towards a specific candidate audience, such as Engineering Interns. When a candidate searches on Google for “Intern opportunities for Computer Science students in Ohio”, your company’s landing page could be their first introduction to your company and a great “hello”, since it addresses their unique interests and needs right off the bat. 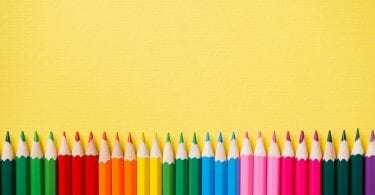 You can find out more about landing pages in our RallyRM Mentor Audra Knight’s blog post on how to attract more applicants with personalized landing pages. 4 – Personalize your candidate journey so candidates know they are valued as individuals. At RallyFwd, Jeanne also introduces and translates her “You Know Me” concept from Customer Experience to the Candidate Experience arena. The “You Know Me” experience is where candidates feel recognized and are not expected to re-introduce themselves and tell their whole story again at each stage of their journey. You might consider how information is being shared internally. Do hiring managers receive all of the pre-screen profile details from Talent Acquisition? Do they know how important it is to take the time to read through the pre-interview material and notes? Consider where process improvements can help enhance internal communications so the candidate doesn’t feel like a broken record. Glassdoor offers some best practice interview tips in their new guide, How to Conduct Better Interviews. As you collect pieces of information about candidates or prospects in your ATS or CRM, you can personalize your content approach to make candidates feel that you’re speaking directly to them. We know from Jess Schuster’s presentation, You Get Me: How a Personalized Career Site Boosts the Candidate Experience, that doing so has major pay-offs – Northwell Health increased their site visitor-to-applicant conversion rate by 78% by personalizing their career site experience! 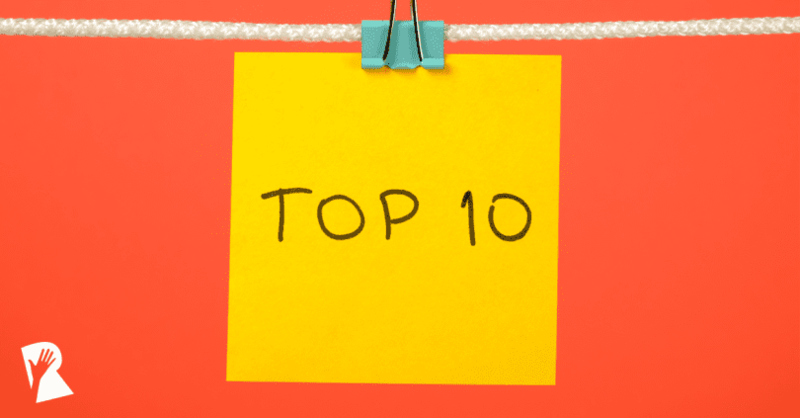 5 – Want to create messaging that resonates better with your ideal candidate? 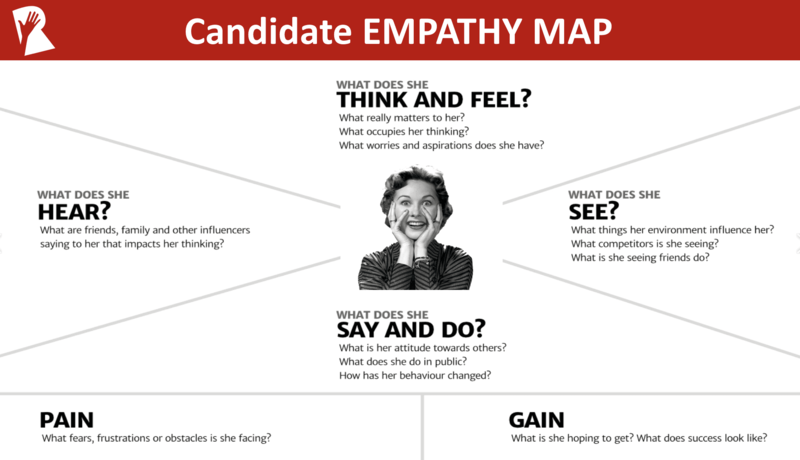 Define your candidate personas and create candidate empathy maps. 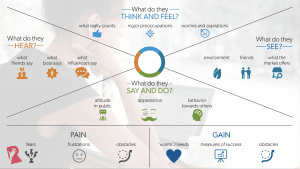 This is part of a design thinking workshop that you can use with your recruiters and hiring managers to outline what your candidates hear, see, say and do, think and feel, as well as their pains and gains. This type of exercise ideally should be paired with candidate persona research where you interview target candidates or recent hires. Considering all of these vantage points can help you to create content that really speaks to your key group. Only once you’re aware of a particular groups’ interests and needs, can you do a great job creating content that speaks to them directly. Need help in translating candidate needs and wants to content (particularly ultra-engaging video content)? The Muse provides inspiration and tips with their new Ebook, How Top Companies Use Video for Candidate Experience. 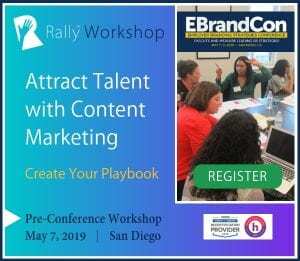 6 – Create email marketing campaigns that share your Employer Brand content, not just job descriptions, to beat out your competition and keep your talent community warm. Email is not dead! In fact, we learned in our panel session, You Have Mail: Communicating with Candidates like a Marketer, that email has a broader reach than Facebook or Twitter and gets more click-throughs. Despite these stats, more than 53% of companies are not creating email campaigns for talent – or, if they are, most are only sending out job descriptions. These organizations are missing out on the chance to share branded content that can keep their organization top of mind with their pipeline or talent community. Our panelists, Charlotte Jones from Lockheed Martin and Jared Nypen from Great Clips, explain the types of content that you could consider sharing over email. Some of the content types they share with their talent communities include career tips, industry-related content (like the latest trends in hair styling or coding languages) and employee stories. They also suggest that you can segment your email list and send out content that speaks to specific role types or locations. Looking for more email marketing inspiration? Jared shares more details on the Rally blog in his article, 5 Tips to Grow Your Candidate Nurture Email Strategy. 7 – If you teach your employees to brand themselves and use social media more effectively, they can help amplify your employer brand. Another key takeaway from Craig Fisher’s presentation is his differentiation between employee branding and employer branding. Employer branding is the messaging the organization is putting out about what it’s like to work at your company. Employee branding is the messaging employees are sharing, which also brands your company. According to Craig, employee branding extends beyond sharing company culture updates. When employees share anything on LinkedIn – personal or professional – people will go to their profiles and look at who they work for. In fact, sharing a bit of semi-personal content (a picture of your dog, for instance, now and then) can really boost your employees’ online visibility. If you can give employees the information, encouragement and confidence to be more active on social, your brand can reach more people – and people are influenced by people much more than by brands. One example of employee branding in action, provided by Craig, is to encourage Talent Acquisition employees to mention what roles they’re hiring for in which regions in their LinkedIn mission statement. This acts as a job ad for your organization every time they post on LinkedIn. This approach is also great for SEO since people search for jobs in their location, so those keywords will be more likely to pull up your employee’s profile during a job hunt. 8 – Informed candidates make better hires. You can inform your candidates by considering what they need to know throughout the candidate journey and proactively providing that information along the way. Informed candidates cost less to source and recruit because they self-identify that your company is a good fit for them – and they will be 42% more likely to stick around longer, according to research by Glassdoor. How do you increase the likelihood that candidates entering your recruiting process are well informed? By considering what they need to know and answering those questions up front. These might be questions about your company’s hiring process, role requirements or culture. 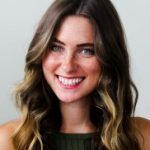 Mallory Brown’s session covers how you can use insights from Glassdoor employee and candidate reviews to address questions and concerns that your candidates may be having. You could then consider updating your core recruiting channels to answer these questions up front in the process before they even apply. For example, if you uncover that many candidates report feeling a bit lost between the pre-screen and interview stages, you could consider publishing a “hiring process” infographic on your site that shares average timelines between stages so people know what to anticipate. If you want more information here, Glassdoor has recently put out a Rally recommended Ebook, How to Recruit Informed Candidates at Scale. 9 – Your careers-focused Twitter channel can be used to make your employer brand accessible and responsive by answering candidates’ questions throughout the candidate experience, not just for social recruiting. Many of us were blown away by the demo of Johnson & Johnson’s new Candidate Experience Platform, J&J Shine. The platform was created to reduce the dreaded “black hole” experience by providing candidates with tons of useful information (from trusted job site The Muse) and helpful resources throughout their hiring process. One key takeaway from Trevor’s presentation is that J&J’s Twitter channel is dedicated to answering candidate questions, not pushing open jobs. The team at J&J started up a Shine Twitter channel (@JNJShine), that answers candidate questions in the same way that other marketing teams answer customer service questions through their channels. 10 – Advocate for your work! As Recruitment Marketers, measurement is ultra-important to demonstrating our impact. As Colleen Finnegan from Squarespace mentions in her presentation, Leveraging Real Employees to Humanize Your Employer Brand, it’s easy to run full speed ahead in execution mode, but we also need to advocate for ourselves and our work and impact by measuring baselines. You can’t properly tell the story of how you’re helping your company grow without the data to back it up. 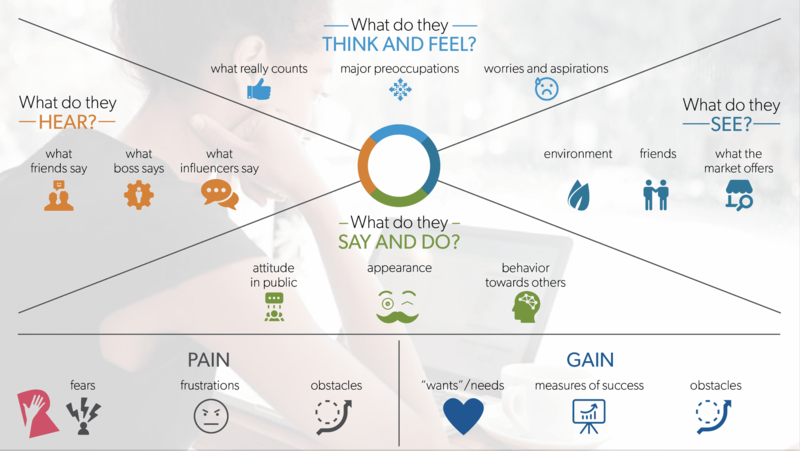 How do you measure Candidate Experience and Recruitment Marketing outcomes? It will depend on what you’re trying to achieve: whether it’s building employer brand awareness, attracting more of a certain type of applicant, contributing directly to more hires or something else entirely. Want to dive deeper on any of these? You can access and stream any and all of the RallyFwd sessions for free and on demand. We hope you enjoy – and feel free to let us know what your top takeaways are by using #RallyFwd and mentioning us on Twitter @Rally_RM! RallyFwd™ Virtual Conference is coming May 1, 2019!